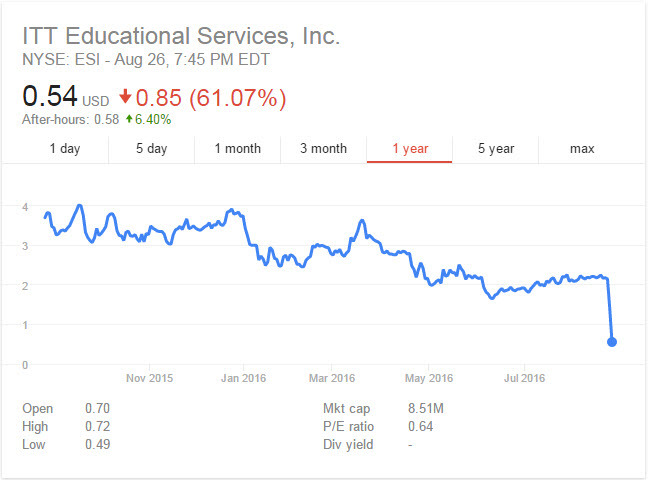 The for-profit educational dominoes keep falling. The Brooks Institute, an art school in Ventura, California, abruptly closed on August 12. But the bigger news is about ITT Educational Services, which has over 40,000 students at campuses across thirty-eight U.S. states. As I wrote in June, ITT’s future has been in jeopardy because of the federal government’s likely de-recognition of the Accrediting Council for Independent Colleges and Schools, ITT’s accreditor. On Thursday, the Department of Education prohibited ITT from enrolling new students who receive federal financial aid — which means the company’s business model no longer exists. ITT must also secure an additional $120 million in credit so that it is able to refund students if its campuses close. The company won’t find a lender willing to bail out such a bad bet and it will be liquidated. Next > Reading for What? And for Whom?